This is a compact pumping station. A motor of 220V, 50Hz, 40W is operated, giving continuous NLG-I/II greasing at the outlet of the pump. The reservoir is built-in with the pump. Pump can develop pressure of 100 kg/cm2. The discharge is of the order of 60 gm/minute. 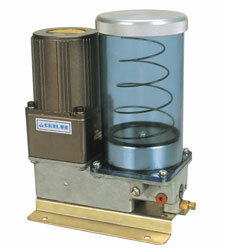 This pump is suitable for, single line progressive greasing system/ grease dispensing system for auto components. Normally this system runs periodically or run as per machine requirements. Outlet port size : Suitable for 6mm OD tube.